Pro Concept Coatings is an exciting breakthrough in the concrete industry. Pro Concept Coatings products will protect and beautify most concrete in a residential or commercial application. They can be applied to garage floors, warehouses, factories, retail outlets, showrooms, institutional areas that have a high volume of traffic. Other areas Pro Concept Coatings can be used on are interior floors such as food preparation areas, main corridors, meeting and conference rooms, swimming pools, bathroom/shower/locker room areas. This is where you come in. We are presently in the process of setting up a dealer network of 300 dealers in territories throughout Canada. There is a huge untapped market awaiting any prospective dealer. These products are much-needed in the Canadian market place. 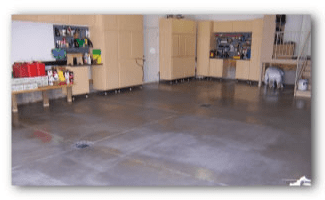 This decorative coating for garage floors or any concrete surface will add years of protection to surfaces that usually need to be frequently resurfaced. Pro Concept Coatings can deliver a variety of coatings for concrete and interior wooden substrates. From your garage to a 40,000 square foot warehouse we have a product that will suit any coating need. You will be able to sell to the “Do It Yourselfer” or apply the product with your trained team of applicators. We urge you to join our family of dealers before all the territories are sold out. Pro Concept Coatings are also one of the most user friendly systems on the market! There is a tremendous need for coatings such as Garage Sealers and PPG High Performance Coatings for residential garage floor applications and industrial floors. Pro Concept Coatings will not only protect the surface but will beautify it. With Pro Concept Coatings you will not have to re-surface your concrete surfaces every 1-2 years. Pro Concept Coatings will give the consumer a guaranteed coating with years of protection. With 10 different basic color schemes and 80 different “fleck” combinations in the Garage Sealers program plus over 100 PPG colors you will be able to match literally any surface to its surroundings. Pro Concept Coatings cures to a seamless hard surface with a guarantee. Most Pro Concept Coatings are classed as non-hazardous goods. It is a very safe product to apply and is very environmentally friendly. Our “no minimum stock level” policy means you only buy what you need. 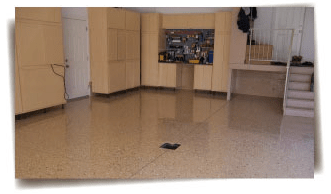 The Garage Sealers product comes in five-gallon kits and can be stored in a dry storage area at room temperature. Pro Concept Coatings are easy to apply. You will save on transportation costs. Because Pro Concept Coatings can create a simulated terrazo look it effectively will hide any minor imperfections or rough spots in your concrete surfaces. Once you become a Pro Concept Coatings dealer you will have access to over 15 other profit generating products at no extra cost except for the actual product itself. Tools can be easily cleaned up with water after application is completed with all epoxy based products.